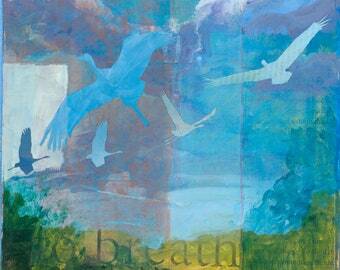 I am an artist — a painter — living in Santa Fe New Mexico. Raised in the northeast, I first came to New Mexico as a teenager, to backpack in New Mexico's Sangre de Cristo mountains at the Philmont Ranch up in Colfax County. The moment I first smelled desert sage I fell deeply, rapturously in love with the Land of Enchantment — never mind the first time I witnessed a desert thunder storm move in, or watched lightening dance across the distant mesas…. [Read: SWOON]. 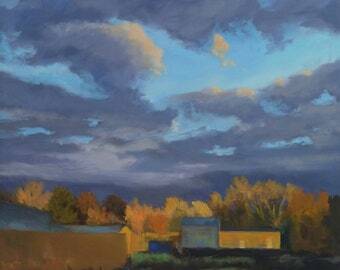 The landscape of New Mexico has been a major focus of my art ever since, both “traditionally” and “abstractly.” My traditional landscapes are usually in oil and often done en plein air. 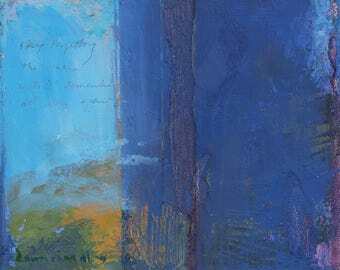 My “abstract” landscapes combine passages of recognizable landscape with abstract elements as well as text (hence my term “textual landscapes”) and are created with oil and mixed media. 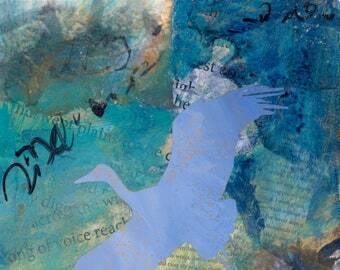 The words in my textual landscapes stem from my own writings and reflections. Whichever style you prefer — more traditional or more abstract; oils or mixed media; large or small; boisterous or whispered — I hope you enjoy delving into my creative world. I delight in talking about my work, so if you have any questions about my paintings, please do get in touch. Thank so much you for spending a bit of time here perusing my creations! Blessings to you — and thanks again for your interest! It is a stunning work that draws you in. It seems to just keep delivering more depth and expects additional consideration every time I look at it. 😍 Expertly packed, shipped quickly. Light, shadow, snow, and sky. Beautiful print of Baldy. 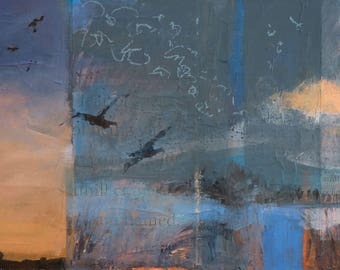 Beautiful painting from the crane series. Packaged with cate as always. It all started on a small parcel of lush and fragrant New Jersey woodlands, where, as a young girl, artist Dawn Chandler first began to explore nature. Childhood camping & backpacking trips throughout New England with her family furthered her love of the outdoors. But it was an intense backpacking trip at the age of 15 at New Mexico’s Philmont Ranch — followed by many more summers there teaching backpacking skills to Boy Scouts — that sealed her destiny: After earning her MFA in painting from the University of Pennsylvania, Dawn strapped her enormous oak painting easel to the roof of her Jeep Cherokee and drove cross-country to make New Mexico her home. That was September of 1994, and Dawn has been celebrating her love of the outdoors — especially New Mexico and the American West — ever since. 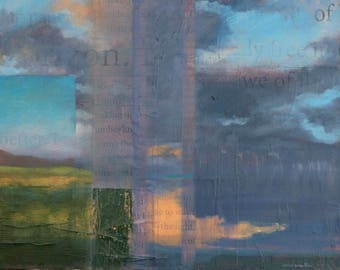 From her “traditional” plein air and studio landscapes, to her uniquely visioned “textual landscapes” merging traditional landscape with passages of text and abstraction, Dawn’s rapture for the great outdoors is without question. Blessed with fans, followers and collectors who delight in her passion for landscape, Dawn is honored to have her paintings gracing the walls of countless private art collections throughout the country. 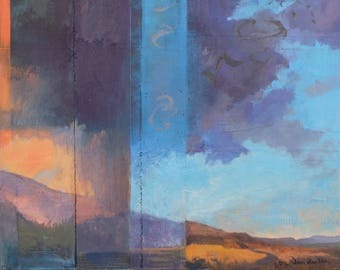 She has been further blessed with opportunities to “escape the maddening world” and focus on painting without distraction at creative residency programs from Maine (Skowhegan School of Painting & Sculpture) to Wyoming (Brush Creek Foundation for the Arts), to Oregon (Playa Creative Residency Program). Beyond painting, Dawn has a voracious appetite for reading (she’s kept a list since the age of 14 of every book she’s ever read), writing (blogging, poetry and the lost art of hand-written letter-writing), pursuing an active plant-based lifestyle (her salad-making skills are nothing short of wizardry), and, of course, hiking and exploring. Among her life’s crowning achievements thus far is having bike-camped across much of Mexico (yes, the country!) and, in celebration of her 50th birthday, solo-backpacking the length of Vermont (274 miles) from Massachusetts to Canada. By her 6th decade she aims to have completed all 2000+ miles of the Appalachian Trail, among other endeavors. 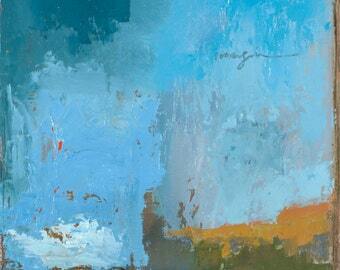 For here you'll find an array of 'traditional' oil paintings of mesas and mountains, cloudscapes and canyons. Regardless of which speak to you, I hope you enjoy exploring the landscape through my eyes. Your complete satisfaction is essential. If you are not delighted by your purchase, please contact me immediately and we will arrange for a return and refund. I accept various forms of payment through Etsy check-out. Note that items shipped to New Mexico addresses will be charged sales tax. Orders are processed usually within 3 - 5 days, and sometimes even within a few hours, depending on the item! If you need something guaranteed sooner than a week's time, please contact me and we likely can get it to you in time for an additional fee. All prints are shipped within the US for free. Those valued over $100 will be shipped with insurance and may require a signature for delivery. Prints shipped to Europe are presently a flat rate and will ship via First Class Mail. If you would like your item to ship to Europe via Priority Mail, there will be an additional charge; convo me to discuss pricing. Let me know what you have in mind and we'll take it from there! I appreciate your interest!